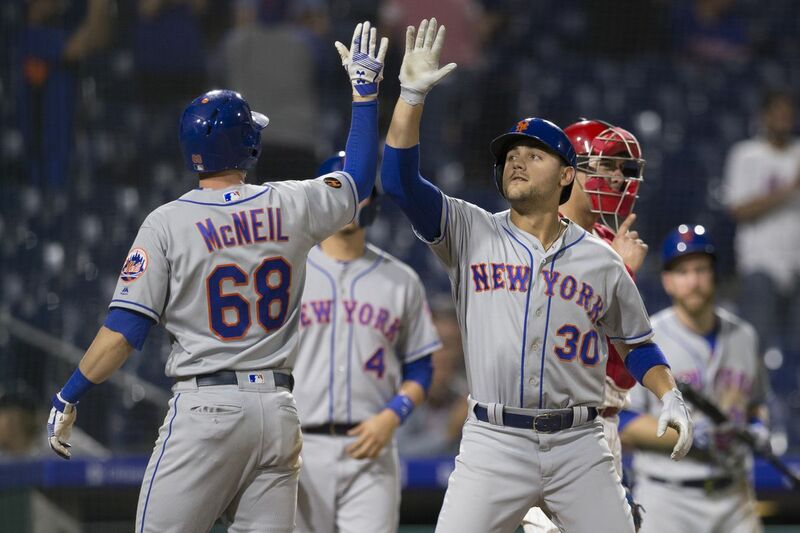 As mentioned in my series preview, the Phillies have spent the past several seasons losing a lot of games to the New York Mets, many of them in extremely aggravating fashion. My hope was that the Phillies of 2019 would put those awful days behind them. But if the first matchup of the year is any indication, the Phillies have yet to cast off their Mets-related demons. I also suspected that the pitching matchup between Aaron Nola and Noah Syndergaard might not live up to expectations. Sure enough, on a cold night, neither pitcher looked sharp. Nola gave up five runs in four innings, while Syndergaard surrendered the same total in one more inning. For the second straight game, the Phillies’ bullpen was called upon to pitch a lot of innings. They weren’t as dominant as on Sunday afternoon, but overall, they did a good job of keeping the Phillies in the game. Pat Neshek took the loss in the 11th, but that fate might have been avoided with better defense behind him. With two runners aboard and two outs, Michael Conforto hit a shot to first base which Rhys Hoskins couldn’t come up with. Cesar Hernandez had a chance to throw out the go-ahead run at the plate, but his throw didn’t come anywhere close. The Phillies had chances to win the game before it even got to that point. In the bottom of the 8th, the Phillies had two men on with Maikel Franco at the plate. Franco hit a blistering shot, which was unfortunately picked up by Jeff McNeil who turned a double play. McNeil is rapidly becoming a Phillie-killer. He was 3-5 at the plate, and made yet another spectacular defensive play in the ninth. The Phillies did manage to tie the game in the eighth when Jean Segura drew a bases loaded walk. Unfortunately, Bryce Harper popped out on the next pitch to end the threat. Segura had another chance to be a hero in the tenth, but with the winning run on third base, he struck out. With eighteen more games scheduled against the Mets this season, the Phillies will have plenty of chances to turn their fortunes around. But based on Monday night, the chances of that don’t seem as great as they once did. Scott Kingery comes out swinging As an injury bug tests Phillies depth, the young infielder is unintimidated. Game Thread 4/18: Phillies at Rockies In their first trip out west, the 2019 Phillies get to spend four games at Coors Field.